Like every industry, publishing is open to scamming and deceptive behaviour in many forms and there are various influencing factors at play – including the pressure to publish that academics face. An abundance of unfamiliar new publications makes it difficult to know which can be trusted and the merits of blacklisting or whitelisting publishers are being widely discussed. One of the motivations for OASPA was to help newer open access publishing initiatives and to keep standards high, but also for organisations to help one another and share experience. Open access, in its many forms, is now a well-established option and one that is supported by many institutions and funding organisations. 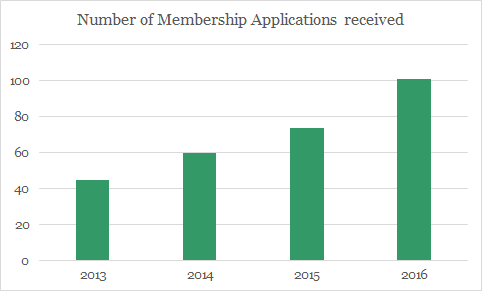 Since OASPA was founded in 2008 we have received almost 400 applications from publishers or allied service providers wanting to join as members, with the number of applications we receive rising each year. We have previously published details about our application procedure. It’s intensive, with each publisher or journal being treated without bias, regardless of geography, size or discipline. A report is compiled with recommendations which are then considered and discussed by the membership committee before a verdict is made by at least 2 of the committee members. As a result, we have significant experience behind us of conducting a very in-depth review of the open access publishing activity of both new and established publishers. Between 2013 and 2015 we accepted fewer than 25% of the total number of applications we received. Some from 2016 are still undergoing review, but we expect the number of accepted applications for last year to fall below 10% once all are concluded. Despite publicising our membership criteria, very few applicants fulfil all of the criteria we require. But it is important to note that just because an applicant might not be approved immediately, it is possible that they can be admitted if key amendments are made under our guidance. Some applications we review are well on the way to meeting our criteria and, if so, we provide advice on the changes required. We work on setting and maintaining standards and best practices in the industry by working directly with publishers whenever we can. All of this work takes up a large portion of OASPA’s resources, but we see it as vital to ensure that we can stand behind our members and to maintain levels of quality and integrity in open access publishing. We also have a documented investigation process. We expect our members to continue to adhere to the same standards while they are a member of OASPA and we consider all evidence that suggests a member might be falling short of our requirements. OASPA supports innovation, which naturally means new players and new models. We see our role as helping to drive high standards in open access publishing, and we want to work with and help any organisation that is making a genuine effort. Many legitimate publishers large and small may not initially meet OASPA criteria, but we consider subsequent applications that demonstrate the crucial amendments have been made. While you can refer to our list of members for the organisations and journals we have approved, it is worth assessing publications yourself, particularly if you are choosing or advising on where to publish the outputs of scholarly research. Checklists can be a great starting point but they do need to be created with care to ensure that they can be fairly applied. There really is no ‘one-size-fits-all’ and our experience is based on never making assumptions, such as the likelihood of editors’ involvement, the suitable size of an author fee or the mechanism for submitting a manuscript. Many legitimate titles charge a small fee to cover running costs – even ‘Scholar Publishers’ running journals voluntarily within their institution, for example – and certainly not all deception in publishing stems from money-making scams. There are are also cultural differences in the way that work is presented and websites are designed. This is another area we provide guidance on where we can. We recognise that it can be very difficult to make individual judgements, though, particularly for researchers in the Global South. International charity INASP is doing valuable work to provide support and guidance for researchers in the Global South which include running a mentoring system, as well as offering training and hosting a wealth of resources on their AuthorAID portal related to writing and publishing research. With all of this in mind, Think. Check. Submit. was devised to help point out some of the key things you can look at. This campaign was designed by people who represent a cross-section of the industry and who know publishing very well. OASPA is pleased to be part of the committee involved and to see the campaign develop. An article in UKSG Insights by Helen Dobson, Scholarly Communications Manager at the University of Manchester Library, gives further attention to the need for Think. Check. Submit. and how it can also help library staff when guiding their faculty in navigating the landscape of scholarly publications. As Helen’s article shows, this is not an issue that is confined to researchers in the Global South. Nor, it should be stressed, are question marks around quality restricted to open access publishing alone. At OASPA we believe that our approach is fair and robust. We have a defined list of criteria, a set procedure for investigating problems that arise and we allow publishers a chance to strengthen their processes before reevaluation by our Membership Committee. We welcome applications from publishers of all sizes to join OASPA and continue to strive towards maintaining the very highest standards in the industry. While we continue to grow we are of course aware that our member list is not comprehensive. We hope therefore that librarians and researchers will make use of Think. Check. Submit. when considering where would be good to publish, an invitation to peer review or to join an Editorial Board. We do not see a ‘quick fix solution’ – some homework is required – but we strongly believe the time investment is well worth it. Lonnie – great point! In the U.S., there is a new-ish organization called the Library Publishing Coalition that asks the same question often, and is leaning toward a world where that is the case. What we need is researchers AND university administrators who see enough of the problems that exist in the current publishing economy, AND are willing to move their resources (funding, staffing, space, time, research) in that direction. And we need senior faculty to allow for junior faculty to shift publishing in that direction.